From This Side of the Pond: How Can You Say No to the Hodgepodge? I think it was late summer when I spied a snake slithering from the grass into the rock wall that sits where forest meets yard. The rocks in our wall are more boulder than pebble, and apparently snakes love rocks. I'd like to think he was on his own, but hubs and I imagine he was meeting friends. Hubs found a snakeskin in the yard when I was out of town one weekend. I know because he saved it to show me. Don't ask me why. Hubs finds snakes interesting and knows a lot about them. It's possible he has a framed snake skin stashed somewhere in the basement. His dad killed it when he was a boy and they framed it. Eww. He'll be a little disappointed that I don't mention here what type of snake it is (was? ), but honestly I can't remember. I think it might be a copperhead which is why its a big deal. Or it might not be a copperhead, but it's something. Periodically he suggests we hang that framed snakeskin upstairs in the pool table room, but I put the kibosh on that faster than you can say Bob's your uncle . When it comes to snakes I'm mostly in the shivers column. We all know people who walk under a perpetually cloudless sky, whose lives seem to fall into place when they need them to fall into place, and who in general seem to have things go their way. That being said, we never really know what went on behind the scenes to get that person to the place they are today. What appears to be 'luck' is oftentimes the result of hard work, good decisions, good timing and/or good relationships established at some point prior. Is the same true of someone we might label as 'unlucky'? Are their circumstances always the result of 'bad luck'? More often than not, I think 'bad luck' is the result of bad decisions, missed opportunity, and lack of initiative. I suppose there are people who would say they're lucky at games of chance. In that small context I might say yes, some people are 'luckier' than others. I haven't been sledding since my kids were young, and probably haven't built a snowman since we lived in Maryland. That was all eons ago, so I'm opting for ice skating. The last time I skated we were living in the UK, so it's been about four years. In the winter months rinks were set up around London and we used to go with the Young Life group to the one in front of Somerset House. Such a beautiful place to skate! We also went skating as a family at the rink set up in Kew Gardens which is not too shabby either. I've attempted to answer this question about four different times. It kept wanting to be its own blog post, so I think I'll save the long form for another day and just say, in short-motherhood. Hubs birthday (September). I made Texas sheet cake cupcakes and took them down to my sister's boat where we were celebrating. One of the best chocolate somethings I've ever tasted. I used to be, but I don't find myself sitting with pen in hand very often anymore. Sigh...doodling...another victim of the electronic age. Don't anybody leave me a comment and tell me there's a doodle app. As fabulous as I'm sure that is, electronic doodling is no way-no how the same as pen on paper. When I was in school I doodled a lot, church too...that's what bulletins are for, right? I had an elaborate thing-a-ma-bob I liked to doodle. It was an intricate swirly shape with a curly cue on the end and I'd connect them until my paper was covered. Do I need to define any of those words for anyone? Sometimes I speak in doodles. I'm taking a little field trip with friends today...if it's interesting I'll tell you about it tomorrow. If it's not interesting I'll probably go ahead and tell you about it anyway. February blogging calls for desperate measures people. Ah yes...phone calls from the children. I long for these but recently had to call my boy back when he called in the middle of a workshop I was attending!!! I thought I'd turned my phone to silent when it went off! The worst part was that I'd plugged it into an outlet in the front of the room, and it was sitting on the tray attached to the whiteboard. Embarrassing! Everyone got a good laugh though. Anyway that was a great superbowl game despite the 49ers loss, i was thinking how happy you must've been for the Ravens. Both teams had great seasons! I too always prefer to have coffee in the morning. Have fun on your trip tomorrow! You just reminded me of my husband's grandfather, who was a rancher, and had rattlesnake skins stretched out and mounted in his house. *shudder* Can't wait to hear about your field trip! Well I made it to the end with no problem at all. I also agree with you about the doodling, electronic doodles just wouldn't be the same! Thanks for being our host here and for coming up with such great mind boggling questions week after week. There IS a lot of doodling sites online that are interactive...but, they're not the same thing. As you say, been years since I've held a pencil to just doodle. Nothing beats good old paper and pen! Agree 100% with your answer to #4...time flies by so very FAST when you're raising children. You just don't realize it until it's all said and done. Nope...not a fan of snakes and it doesn't help to have a hubby who thinks he's Steve Irwin! Enjoy your field trip, Joyce! Also on Nr. 6 .... a great list. I forgot to add trips to anywhere on my question. The first thing that came to mind was my daughters. I actually did HP today. Yeah! I am wondering where you are going today? I hope you do post about it. I don't know how you come up with all these questions each week. Your a great hostess! Love the questions this week. Thought provoking as usual. Have a good trip out today. I'd like to try one of those cupcakes!!! I like your answer about luck. Some people do seem lucky, like my mother. She used to win things ALL the time! Have fun on your field trip! A February field trip sounds like fun! Enjoy. I like your answer on luck. I always doodled on church bulletins! Hope your field trip is fun but if it's not I am sure the time with your friends will be wonderful. Hope you have fun on the field trip. Where to? With who? Details please. Those cupcakes sound delicious!!! I want to make a batch! I can't wait to hear about your field trip. And as usual, it was no problem to make it to the end. 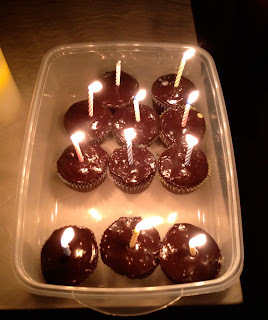 Well, how cute an idea, cupcakes with candles for someone's b'day. I'm going to remember that. The Princess and I are baking Valentine cupcakes on Friday. She loves, loves "pupcakes!" Some people do seem to be lucky. Is the trend now-birthday cupcakes? Both daughters chose birthday cupcakes instead of the traditional birthday cake. For some reason I can't link up. The cupcakes looked heavenly...and I don't usually go for cupcakes. I can't wait to hear about the field trip...I hope it is great fun. Loved the questions this week. Ok you have 2 blog post ready in the wings, one is the field trip and one is #4. Interesting,every interesting. I've been meaning to try a Texas Sheet Cake recipe that I have. Now after reading your post I am really in the mood for them. Texas sheet cake cupcakes sound yummy! Hope your field trip was nice! Our church has paper in the pews labeled Art Work for the kids. Sooo looking forward to the field trip post! A great post, I love movie popcorn and eat cupcakes whenever offered. Take care. I have no idea what a Texas Sheet Cake is, but it looks good! Cupcakes....it's a sign! I was just telling my husband that I need to eat a cupcake. I can't remember the last time I had one! Definitely need to remedy that. Our anniversary is coming up! Hmmmm. Good questions. Looking forward to next week's! I used to doodle on the time sheets when I was a timer at the kids' swim meets. I'm sure the meet master appreciated my artwork when the time sheets were turned in at the end of the meet! I will try to remember to come back on Tuesday for the meme. You write well.